Last month I inadvertently watched Emmerdale, and as a result, I got to enjoy a rare trip out on the trains with the country folk. 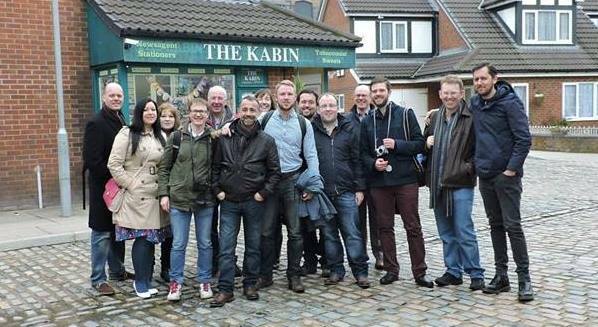 I'm much more of a Corrie fan, of course; I like my Northern soaps laced with a heavy dose of camp. 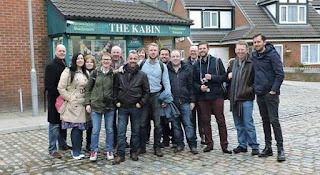 I write the occasional piece about how awful Michelle is for the Coronation Street Blog, and I've actually visited the set not once, but twice. I've had my picture taken with Kevin Webster! You can imagine my delight, therefore, when the distinctive purple livery of Northern suddenly made an appearance in last night's episode. Faye and Seb were off on a day trip to Chester (actually Faye was planning on running away to Dublin via Holyhead - it's a soap opera, go with it). However, signalling problems curtailed their plans and dumped them off at "Mosford" station. The Emmerdale station was familiar to me, but not familiar enough; I vaguely remembered it but had to do a lot of trawling through my memory banks to work out where "Connelton" was. Mosford, on the other hand, was immediately ringing bells. I knew that station. I recognised it. Was it Patricroft? It was definitely this side of Piccadilly. A descent into a dramatically lit subway and I knew it. Irlam! This was definitely Irlam, on the Warrington line between Manchester and Liverpool. I sighed. I already thought Faye's attempt to spirit Seb out of the country was a bit naive, but the poor girl couldn't even work out that there are direct trains between Manchester and Chester. She didn't deserve to succeed. One commercial break later and Faye and Seb were having a Coke at the very nice cafe bar in the Irlam station building. Seb was absolutely desperate to get back into town before six o'clock, which is why he took some time to have a nice sit down and a drink. Later, rather than boarding the bus replacement service as Faye suggested, he tried to steal a Ford Fiesta, then legged it when the man from Northern turned up; it didn't really make sense on any level. I'm not sure where Mosford was meant to be but they were talking about getting back to Weatherfield like it would involve a trek over the Atlas Mountains on a donkey. Still, it was good to see a bit of my territory on the telly, and one of the pretty ones too. I suppose Northern aren't likely to offer up the desolate hellhole that is Ardwick for filming purposes. If you need any future advice on railway stations, ITV, I have a very reasonable consultancy fee. It might involve access to Gary Windass' dressing room, but I'm happy to come in at any time.